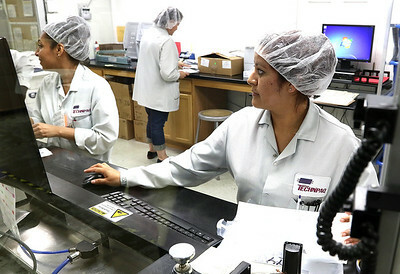 H. Rick Bamman - hbamman@shawmedia.com Technipaq quality control employees Jessica Galdamez (left) and Alma Ortiz inspect flexible sterilizable healthcare packaging materials on Monday, June 22, 2015. H. Rick Bamman - hbamman@shawmedia.com Technipaq employees work on the production line on Monday , June 22, 2015. The manufacturer of flexible sterilizable healthcare packaging materials is planning a 4500 square foot expansion at the facility. H. Rick Bamman - hbamman@shawmedia.com Technipaq press operator Wyatt Taylor of McHenry monitors the production run on Monday, June 22, 2015 at the Crystal Lake facility. 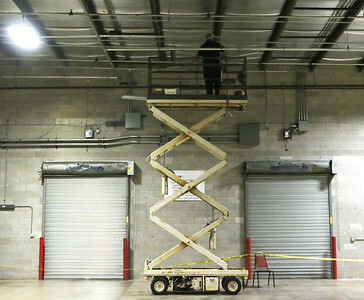 H. Rick Bamman - hbamman@shawmedia.com Using a scissor lift a worker installs pipe in the ceiling of the former storage area of the Technipaq building in Crystal Lake. The manufacturer of flexible sterilizable health care packaging materials is planning a 4500 square foot expansion at the facility. 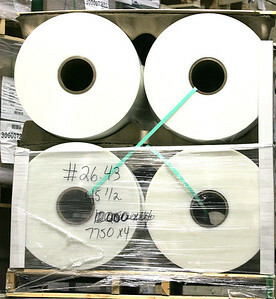 H. Rick Bamman - hbamman@shawmedia.com Rolls of plastic wait to be transered to the production floor at Technipaq in Crystal Lake. 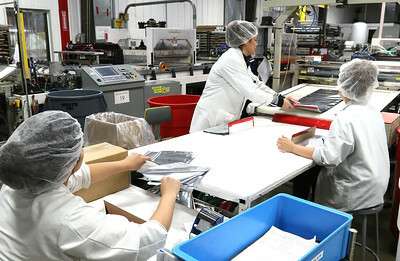 The manufacturer of flexible sterilizable healthcare packaging materials is planning a 4500 square foot expansion at the facility.